This story was updated at 1:18 p.m. EST March 5. Oklahoma's state scientists have suspected for years that oil and gas operations in the state were causing a swarm of earthquakes, but in public they rejected such a connection. When the Oklahoma Geological Survey (OGS) did cautiously agree with other scientists about such a link, emails obtained by EnergyWire show the state seismologist was called into meetings with his boss, University of Oklahoma President David Boren, and oil executives "concerned" about the acknowledgement. The seismologist, Austin Holland, told a senior U.S. Geological Survey official that as far back as 2010, OGS officials believed an earthquake swarm near Oklahoma City might have been triggered by the "Hunton dewatering," an oil and gas project east of the city. "Since early 2010 we have recognized the potential for the Jones earthquake swarm to be due to the Hunton dewatering," Holland wrote to USGS science adviser Bill Leith in 2013. "But until we can demonstrate that scientifically or not we were not going to discuss that publicly." Instead, he pointed to changing lake levels. And when USGS officials linked a "remarkable" surge in earthquakes in Oklahoma and other states to drilling waste disposal in 2012, OGS criticized their "rush to judgment." Holland told EnergyWire the intense personal interest shown by Boren, Hamm and other leaders hasn't affected his scientific findings or those of OGS. "None of these conversations affect the science that we are working on producing," Holland told EnergyWire. "We have the academic freedoms necessary for university employees doing research." Oklahoma Geological Survey seismologist Austin Holland. Photo courtesy of Austin Holland. But Holland and OGS have been the voice of skepticism in the scientific community about connections between oil production activities and the hundreds of earthquakes that have shaken the state. Industry and political leaders in the state, where one out of every six jobs is linked to oil and gas, have seized on that skepticism. "Researchers in Oklahoma, notably Austin Holland with the Oklahoma Geological Survey, have repeatedly said the increase in seismic activity cannot be fully explained by man-made causes," Oklahoma Independent Petroleum Association (OIPA) President Mike Terry said in a 2013 statement. Other states have ordered wells permanently shut down and imposed strict rules after earthquakes. But Oklahoma regulators have been reluctant to permanently shut down wells and have limited new regulations to information-gathering requirements. "We know a lot of it's just natural earthquakes that have occurred since the beginning of the earth," Oklahoma Gov. Mary Fallin (R) said earlier this year in an interview with the Tulsa World, "but there has been some question about disposal wells." Federal and academic seismologists say the wave of shaking in Oklahoma and other central states is not from "natural earthquakes." They link it to disposal of wastewater by oil and gas companies. "This rise in seismic activity, especially in the central United States, is not the result of natural processes," USGS said in a recent release. "Deep injection of wastewater is the primary cause of the dramatic rise in detected earthquakes and the corresponding increase in seismic hazard in the central U.S."
Oklahoma's top elected officials have avoided talking about the state's earthquake swarms, leaving the response largely to Holland, 40, who joined OGS in 2010. No other state official has done as many television and news interviews about earthquakes. The agency's 2012 annual report quipped that "Holland seems to be on everyone's speed dial when the ground starts shaking." Scientists have known for decades that injecting waste fluid in deep disposal wells -- from oil and gas or other industrial activities -- can cause earthquakes in rare cases. More "earth-friendly" industries, such as geothermal and carbon capture and storage, can also set the Earth rumbling. But high-volume fracturing and some other technologies driving the U.S. oil and gas boom create many times more wastewater than conventional production. From 1975 to 2008, the state of Oklahoma averaged one to three quakes a year of magnitude 3 or greater, according to USGS. In 2009, the number of quakes began rising sharply. There were 20 in 2009. In 2012, the number went over 100. Last year, it had 585, an average of 1.6 a day (EnergyWire, Jan. 5). That was three times as many as California. In 2011, Oklahoma was hit by its largest-ever recorded earthquake, a magnitude-5.7 event near Prague, Okla., that injured two people and damaged more than 200 homes and businesses. Seismologist Katie Keranen, then a professor at the University of Oklahoma, published a peer-reviewed paper in 2013 linking the Prague quake to nearby disposal wells. "There's a compelling link," Keranen had explained, "between the zone of injection and the seismicity." "It has been suggested that this sequence represents earthquakes triggered by fluid injection," said an OGS statement posted shortly before Keranen's article was published. "The interpretation that best fits current data is that the Prague earthquake sequence was the result of natural causes." Not long afterward, Keranen left Oklahoma for a professorship at Cornell University in Ithaca, N.Y.
State officials continued to allow the companies in the area to inject near the fault that had ruptured. Statewide, injection of oil and gas waste fluid rose 42 percent from 2010 to 2013. In the fall of 2013, though, OGS edged toward acknowledging a link between the state's earthquakes and its oil and gas industry. OGS email correspondence, obtained by EnergyWire through an Oklahoma Open Records Act request, show Hamm and other Oklahoma leaders then took a personal interest. In September 2013, earthquakes started to rattle Marietta, a small town in southern Oklahoma near the site of a new disposal well. Holland investigated, and his preliminary report focused on the correlation between disposal operations and the earthquakes. He has not published a final report, but it's the closest OGS has come to linking earthquakes to a specific well. In October 2013, OGS joined in a USGS statement about the growing seismic risk in Oklahoma. Under the OGS seal, it said "activities such as wastewater disposal" may be a "contributing factor to the increase in earthquakes." 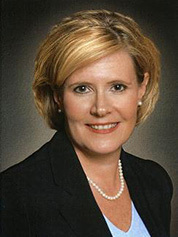 Oklahoma Corporation Commissioner Patrice Douglas. Photo courtesy of the state of Oklahoma. Industry leaders were not pleased. Holland was summoned a week later to the headquarters of the Oklahoma Corporation Commission (OCC) with Jack Stark, who was then senior vice president of exploration with Continental Resources. Stark is now president and chief operating officer. OCC, overseen by three statewide elected commissioners, regulates oil and gas in the state. The meeting was in the office of then-Commissioner Patrice Douglas. Douglas and the Continental executive were "concerned" about the joint statement with USGS and a story about it by EnergyWire, Holland recounted later in an email (EnergyWire, Oct. 25, 2013). Holland wrote that he had tried to explain to them that the joint statement was "made better" by his input. "Continental does not feel induced seismicity is an issue and they are nervous about any dialog about the subject," Holland wrote to his bosses after the 2013 meeting. "They are in the denial phase that this is a possibility." At the time, Douglas was about to run for Congress. She got more campaign money from Continental executives in 2014 than anyone except Sen. James Lankford (R-Okla.) and the Republican National Committee, according to OpenSecrets.org. The $14,775 she received from Continental includes $6,575 from Hamm, who did not contribute to her Republican primary opponent, Steve Russell. Russell beat Douglas in the primary and is now a congressman. In the meeting, Douglas said she "wants to, of course, protect the safety of Oklahomans, but also balance that with industry in the state," according to Holland's email. Holland "blind copied" himself on the email. University of Oklahoma President David Boren. Photo courtesy of the University of Oklahoma. The meeting with Hamm and Boren was about three weeks later. "I have been asked to have 'coffee' with President Boren and Harold Hamm Wednesday," he wrote in an Nov. 18, 2013, email to a co-worker. "Gosh," Smith responded. "I guess that's better than having Kool-Aid with them. I guess." "Wow. That's a lot of pressure," said Murphey, a Republican whose district has been rattled by numerous quakes. "That just sends chills up your spine if you're from Oklahoma." Hamm is the chairman and CEO of Continental. But as the founder of the company, he's much more than that. He has a sharecropper's son-to-billionaire life story that has cemented him as the embodiment of the state's wildcatter ethos. Forbes listed him last year as the 43rd-richest person in the country. He served as the energy adviser for Republican presidential nominee Mitt Romney in 2012. Continental Resources Inc. CEO Harold Hamm. Photo courtesy of Harold Hamm. He gained fame outside of business circles last year as the ex-husband in one of the largest-ever divorce settlements in U.S. legal history. Hamm is also one of the industry executives in Oklahoma who don't believe in a connection between disposal and earthquakes. Asked about the shaking after a 2014 congressional hearing, Hamm told EnergyWire, "It's certainly not related to oil and gas activity." Perhaps more relevant to Boren and Holland is Hamm's relationship to the university. 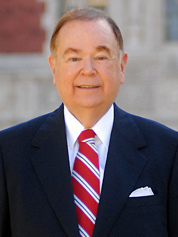 In March 2011, Boren declared Hamm's $20 million gift launching the Harold Hamm Oklahoma Diabetes Center "the largest single gift in the history of the Health Sciences Center." In addition, Boren serves on Continental's board of directors. In 2013, he received $272,700 in cash and stock for his service. Asked about the meetings, Continental spokeswoman Kristin Thomas said she was not familiar with them. "But I do know that research had been conducted by a geologist at Continental showing broader global earthquake activity spanning both time and distance," Thomas said. "There was a desire to educate and provide greater global perspective on earthquake activity." News coverage in Oklahoma indicates that the Continental geologist, Glen Brown, did not begin his research until around December 2013, after Hamm's meeting with Boren and Holland. Boren declined comment through a spokesman. Attempts to reach Douglas were unsuccessful. After the meeting with Stark, a long-standing swarm of earthquakes northeast of Oklahoma City expanded to the north and grew stronger. The Jones swarm had been rattling the area for several years at that point. Keranen had recently presented scientific findings that the Jones swarm was linked to oil and gas, and she said the expansion was likely also connected. Holland, though, downplayed any connection to the Hunton Dewatering project. In a television interview at the time, he pointed toward natural causes (EnergyWire, Nov. 4, 2013). In a scientific posting, he pointed at changing water levels at a nearby lake (EnergyWire, Nov. 14, 2013). "The correlation between lake levels at Arcadia Lake and this earthquake swarm is interesting and requires further investigation," Holland wrote. That concerned Leith, who runs the earthquake hazards program at USGS. He wrote to Holland saying the lake level theory was "unlikely" and possibly unhelpful. "This could be very distracting from the larger issue of earthquake safety in Oklahoma," Leith wrote, "and the role that wastewater injection may be playing." Holland replied that he was "quite skeptical myself" of such a link. But he said reporters asked him about it, so "my hand was forced on this matter." He added that the agency had suspected ties between the Jones quakes and Hunton production for three years, but had been reluctant to discuss it publicly. "Now, we have no choice, because others are discussing this publicly," Holland wrote. "This is not helpful to our efforts because every hour I spend talking to reporters is another two hours really can't be doing the research that needs to be done. There has been far too much hype about the recent earthquakes." Asked by EnergyWire why he hadn't publicly aired suspicions that Jones swarm was caused by oil production activities, Holland replied, "I guess you should go back and read my paper." He sent a citation to a paper he published in 2013, which does not make a link between the Jones swarm earthquakes and the Hunton dewatering. Dewatering is a technique, pioneered in Oklahoma by a company called New Dominion LLC, in which massive amounts of water laced with oil are extracted from spent conventional fields. The oil gets separated out, and the water gets injected back underground into deep disposal wells. "It is unclear as to the cause of the Jones earthquake swarm," Holland's paper states, "but it is clear that whatever the cause the resulting seismicity is quite different from that observed elsewhere in Oklahoma." In February 2014, OGS again rejected the link between the Jones swarm and the oil and gas industry. "At this time a direct link to oil and gas activity and this unusual earthquake sequence cannot be established," OGS said in a statement after Guthrie, Okla., was rocked by a series of quakes (EnergyWire, Feb. 20, 2014). In a media outing earlier this year, Holland acknowledged to reporters from the Tulsa World, The New York Times and The Washington Post that the industry has tried to influence his work. "I can't really talk about it," Holland told the reporters. "We're going to do the right thing." But Bob Jackman says Holland did talk about it last year and indicated that it was Hamm who was leaning on him. Jackman is a Tulsa petroleum geologist who has made himself a thorn in the side of Oklahoma's establishment on issues such as earthquakes. In an opinion journal article last year, Jackman described approaching Holland about earthquakes after a conference in September. Jackman said he pressed him about earthquakes until Holland blurted out, "You don't understand -- Harold Hamm and others will not allow me to say certain things." Holland told EnergyWire that Jackman had misquoted a private conversation, but declined to clarify it. Jackman said he wrote down Holland's words immediately, and stands by his recollection. OGS's position on the cause of the earthquakes has drawn derision, even from within the agency. In April 2013, another OGS scientist, petroleum geologist Richard Andrews, said in a note to a family member on his agency email account that OGS shouldn't be telling the public that the earthquakes are naturally occurring. "Myself and a few other geologists that know of the Hunton dewatering oil operations in the affected areas and subsequent re-injection into the Arbuckle [are] the culprit," wrote Andrews, who is now the interim director of OGS. "I am dismayed at our seismic people about this issue and believe they couldn't track a bunny through fresh snow!" While Oklahoma leaders debate the cause, seismologists have warned that the surge in relatively small earthquakes has increased the risk of a larger quake that could cause widespread damage and serious injuries.